Fresh and wholesome, this dazzling array of Nature’s best is sure to wow anyone on your gift list. Loaded with the finest fresh gourmet nuts and dried fruit obtainable, including Natural California Almonds, Raw Giant Whole Cashews, Fancy California Walnuts, California Pistachio Nutmeats and Jumbo Turkish Apricots. Net. wt. 2 lbs. Great gift that is flexible for almost any occasion, healthy, and very high quality. Fresh and loads of nuts. I sent this basket to my elderly parents. They were so pleased. ProsAbundance of nuts. Superior Nut will not rip you off. Excellent array of fresh nuts, tasty and wholesome...as a bonus the freight was free. What more can you ask? Had these sent to my husband while he was being quarantined after having radioactive iodine and being on a no salt low iodine diet. Delicious and healthy! Thank you so much! I LOVED THAT THERE WAS FREE SHIPPING. THE PEOPLE THAT RECEIVED IT ENJOYED IT. ProsDECORATIVE BASKET. ALSO, NUTS WERE SEPARATED. ConsI PREFERRED 2 1/2 POUNDS OF PRODUCT. ALSO, MORE VARIETY OF FREE SHIPPING. given as a gift. very well received. contents fresh and flavorful. Great selection and quality. Shipping was fast and conveinent. Purchased for dad... who has everything. He absolutely loved them. Liked the selection and choices and packaging and everything went well with shipping. ProsWeb site was easy to use, too. I purchased this gift basket and was delighted to hear that the gift was delivered as promised. Great customer service. All the dried fruits & nuts contained in this package were so delicious, fresh & salt-free. I will definitely order from this merchant in the future. I got this for Farher's day for my Dad . He absolutely Loved it !! It is a healthy snack which I love to give . I ordered this gift for Father's Day and had it shipped to my uncle who lives in Nanticoke, PA. He loves natural/organic food and this nut assortment was the perfect gift for him. I especially ordered it becuase there wasn't any salt added, and this was a big plus for me. Also, the fact that the nuts were shelled was a big hit with my uncle and he is still raving about the gift!! Brother- in-law loved this get well assortment Nuts are very fresh - excellent quality. The recipients loved everything especially the freshly dried apricots. I was pleased to know it arrived at the scheduled time. 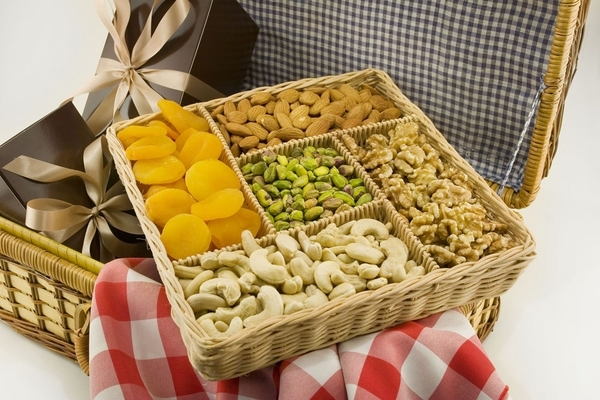 The nuts and fruits are a great gift item as well as for yourself. The containers, make it a little more special. The shipping was fast and my family loved the gift basket. Will definitely purchase from here again. This was a gift to our daughter and her family and they loved the basket full of goodies. They are vegan and this is the perfect gift in regards to keeping it healthy and delicious. ProsThe quality and price is very good. I sent these to relatives and can't report from direct experience. But they called to say the nuts were delicious. ProsNice presentation as a gift. ConsSeems really pricey, even on special. Fantastically fresh & natural variety! It was the perfect gift to give! I ordered this as a gift to be delivered to the staff of the dental office I visit! They loved the gift! I got the nuts as a gift, they were excellent. Would recommend. The nuts and dried fruit were excellent, I sent them as gifts, and they were a hit. This is one of my favorite gifts because everyone always tells me how much they enjoy it compared to other gift baskets. I like it because it is an excellent value. Excellent quality and presentation. Great value and fast delivery. Nicely packed. Nuts were tasty and of good size. Would have preferred if they were salted. The nuts were great! Perfect and whole. Not a single imperfection. Thanks!